Today we depart Tel Aviv for the desert. Our day begins with the chance to join a real archaeological dig at the Tel Maresha excavations. Here you’ll take part in the hands-on search for ancient objects, compare your finds and explore the other-worldly bell caves of neighbouring Beit Guvrin. Next is an exciting stop for the whole family — Kfar Hanokdim, and our Desert Experience, promises nothing but fun and relaxation. Here we’ll meet the Bedouin –a caravan of camels will carry us across the parched landscape to a traditional “Chafla” Lunch — a fabulous lunch and a unique way to experience the famed hospitality of these people for whom the desert is home. The Dead Sea, the day’s ultimate destination, is like no other place on earth — your unique experience here will be one you will always remember. Floating effortlessly in the warm waters, covering each other in the rich, therapeutic mud – it’s impossible not to have fun as a family…. After dinner at the hotel, you’ll meet the Rabbi and the bar/bat mitzvah children will have a chance to visit with him and rehearse individually. Your hotel is lovely and so is the sunset from poolside…. Breakfast Lunch and Dinner. Want a little more time? You are welcome to extend your time in Tel Aviv for three more nights. Three additional days to enjoy the world-class beaches, culture, nightlife, food and shopping opportunities that only this city can offer. Eilat, Egypt and Jordan are available!! * Bar/Bat Mitzvah child age must be 12 or 13. 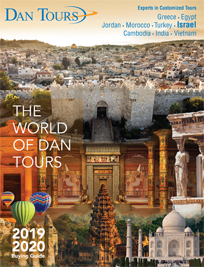 Dan Tours have gained an excellent reputation operating Family Bar/Bat Mitzvah Tours. In order to maintain this reputation we wish to advise you that minor changes may be made in the itinerary or the accommodations. These changes may occur prior to departure and even during the Tour itself. The changes are usually a result of insufficient space, changes in site schedules, safety and ease of transportation or the inability of the supplier to provide services to meet our standards. We will make every effort to ensure that any changes made to the Tour comply with our high standards. The terms and conditions printed on the back of the Dan Tours Brochure, apply to this Tour.